Tonic is our new Mom with a recent litter of nine puppies. She is a spunky little girl that reminds you of the Energizer Bunny. 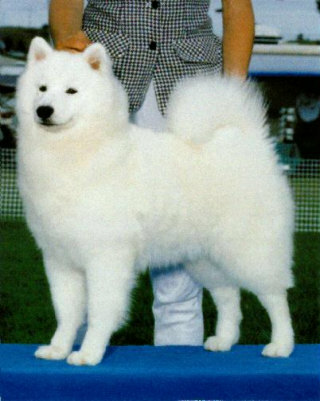 She made the list of top Canadian Samoyed puppies, but was not shown extensively. She is a very affectionate and loving dog and is content being a close companion. CH. JASAM'S SNOMIST OF TRIARCTICA C.D. CH. TRIARCTICA'S COTTON CANDY C.D. CH. TRIARCTICA'S RUFFLES 'N LACE C.D.